About Mouchette » WTF is Digital Art ? WTF is Digital Art ? Web Art, or Internet Art, or Net Art, is art that is accessible to anyone with an internet connection (and a right browser). 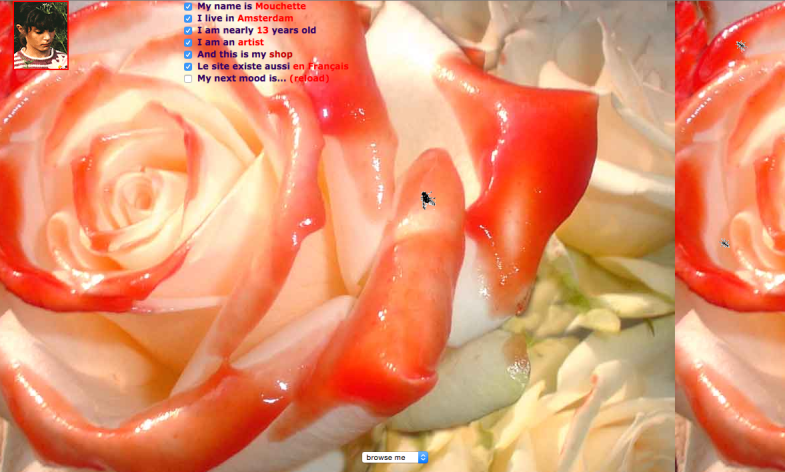 Net art can roughly be described as a website that is an art work in itself. Like other digital art Net Art is transient – it exist only while the technology, software, and code are compatible. Net Art must also be constantly supported and unkept otherwise it will disappear, many examples of Net Art no longer exist because the domain name expired. So this week I will be sharing my 5 favourite examples of Net Art, that will hopefully still be around as this is published. Considering the temporary nature of Net Art this website is even more impressive as it first made its appearance in 1993. The best part of the art work is hidden in the source code. A work that first appeared in 1996 and has since made its way into university syllabi, and has been remade, remixed, and rethought by countless digital artists. In other words this work has already entered the cannon of Art History. My boyfriend came back from war uses the web and the tools it provides to tell a story of a couple that is trying to reconnect after he comes home from war. As you click at the images and gif their story unravels. The website that toys with and explores the issues of identity online. Mouchette persona is loosely based on Robert Bresson’s 1967 film ‘Moucgette’ (google it). Basically an interactive Torah, but so much more. A surprisingly addictive, and very colourful website. One of the interesting things about it is that, though available for view to the public, the site is owned by a collector. It was successfully sold for $3,500 at Phillips auction.